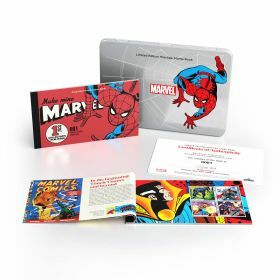 A real treat for the comic book lover, the Marvel Prestige Stamp Book is a 24-page booklet which offers a fascinating insight into the history of Marvel Comics tracing its evolution from its origins in 1939 through to the present day. 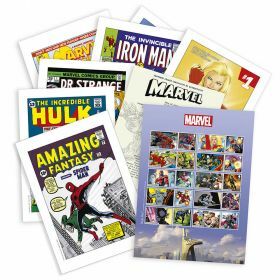 How the ‘British Invasion’ of editors and illustrators in the 1980s revolutionised Marvel’s stories. A closer look at the process behind making a comic book illustration from pencil sketch to the final colour print. A classic retro Iron Man front cover. 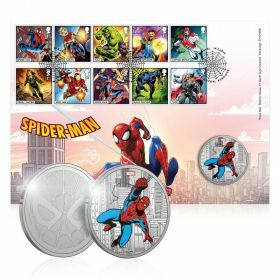 Four special panes which include all fifteen Marvel stamps as well as a pane of definitive stamps with the iconic Comics Code Authority seal of approval (which used to be appear prominently on comic book covers) at the centre. 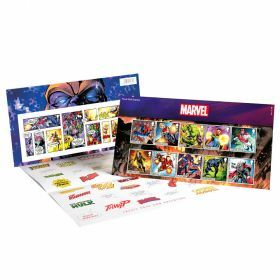 Four special panes which include all fifteen Marvel stamps as well as a pane of definitive stamps with the iconic Comics Code Authority seal of approval (which used to appear prominently on comic book covers) at the centre.